Home / News / In Russia, feminist memes can land people in jail. But beating women won't: 14,000 women die annually from domestic violence-related injuries which some have attributed to Russia's "slapping law." In Russia, feminist memes can land people in jail. But beating women won't: 14,000 women die annually from domestic violence-related injuries which some have attributed to Russia's "slapping law." In Russia, 14,000 women die annually from domestic violence-related injuries which some have attributed to Russia's "slapping law." In early 2017, the lower house of Russia's Federal Assembly decriminalized some forms of domestic violence, meaning that first-time offenses against a partner or child bear a fine rather than a criminal charge and trial. Now that the 'slapping law,' which was backed by the Russian Orthodox Church and signed by Vladimir Putin, is on the books, women have few protections from domestic violence. Even as women and children lose protection from domestic violence, those who speak out against it have increasingly been handed criminal charges themselves. In January 2018, Artyom Iskhakov, a 19-year-old Russian man, killed his roommate and former girlfriend, Tatyana Strakhova, who was also 19. Following the murder, he raped her body and then, before killing himself, confessed in a letter published on Russia's most popular social networking site, VKontakte. According to Iskhakov's note, he was motivated by jealousy. As the story spread, commentators across Russia took to blaming Strakhova for her own murder. Some published photographs of the young woman with alcohol and cigarettes, or in her underwear, which they presented as evidence that she was at least partially guilty for inciting the attack. In an article detailing her Instagram activity, meanwhile, the Russian online publication Dni.ru noted that "Tanya Strakhova turned out to be less innocent than everyone thought." Some commenters on Strakhova's Instagram page even suggested that Iskhakov was, in fact, the victim — provoked by Strakhova into killing her. In reaction to Strakhova's murder and the victim-blaming that followed, feminist activists launched a viral hashtag #ЭтоНеПоводУбить (#NoReasonToKill). Women across the country splashed the hashtag across photographs of themselves, some in revealing clothing, to protest the idea that a woman's appearance could be a provocation to murder her. Such activists face an outright war on women in Russia. The numbers of dead are staggering: 14,000 Russian women die annually from domestic violence-related injuries. That's about 38 women killed every day, almost two women every single hour, and one every 40 minutes. Making matters worse, Russia's political system condones such violence. In 2017, according to Human Rights Watch, up to 36,000 Russian women and 26,000 children faced daily violence and abuse. And most of the time — perhaps as much as 91%, according to 2013 data from the ANNA Center for the Prevention of Violence — the aggressor is a woman's husband. Domestic violence is so common, in fact, that it affects one in four Russian families, according to ANNA. Two-thirds of all homicides in Russia are linked to domestic and family issues, and incidents of domestic assault on women and children increased by 20% between 2010 and 2015. Beneath these headline numbers is an even grimmer story. Of women who called a national help line for domestic violence victims in 2014, 72% never went to the police. Recently, reporting has started to fall off even more — in 2017, 36,037 domestic violence cases were disclosed compared to 65,543 in 2016. Women's rights campaigners have linked the decline to a new law that makes it less likely that a man accused of abuse will ever be punished. In early 2017, the State Duma, the lower house of Russia's Federal Assembly, decriminalized some forms of domestic violence, meaning that first-time offenses against a partner or child bear a fine rather than a criminal charge and trial. The controversial bill was backed by the Russian Orthodox Church, which has historically advocated for less government interference in household matters. The church's commission on family affairs even stated in 2015 that it considers the term "domestic violence" to be a tool used by radical feminists. It similarly maintains that the West is behind efforts to make domestic violence a crime in Russia. In drafting the legislation, the bill's backers in the Duma seem to have taken a page from the church's book. For example, Olga Batalina, one of the measure's two female co-authors, said her intention was to protect the family institution. Another author, Yelena Mizulina, an ultra-conservative Russian senator, publicly referred to women as "weak creatures," and called "respect for the spouse, authority in the family — a must." Mizulina has also stated that she believes women "do not take offense when they see a man beat his wife." Russian President Vladimir Putin, who officially signed the measure (known as the "slapping law") into law on Feb. 7, 2017, has a poor record on women's rights. Since his first presidential term in 2000, Putin has partnered with the Russian Orthodox Church to promote traditional conservative values, oppose LGBTQIA rights, and condemn feminism. Now that the slapping law is on the books, women have few protections from domestic violence. Police are unlikely to interfere in attacks unless they cause "substantial bodily harm," as per the new law. And already, according to Human Rights Watch, police are starting to refuse to investigate women's reports of domestic violence. This marks a return to the treatment of women in the 1990s, when the police and authorities simply refused to get involved in family matters, and spells more violence to come. Feminist blogger Lyubov Kalugina, for example, was recently charged with inciting hatred toward men and now faces up to five years in prison. The investigation and resulting charges were triggered when an anonymous man complained that her posts, including a meme that showed a woman holding a frying pan with the words "Beat up a brute, save Russia!" beneath, insulted him as a male. In other words, a woman who posted a mildly humorous meme may serve five years in prison. A man who beats up his partner may only be asked to pay a small fine — if the assault is even reported, as only 10% are. In Russia, in other words, the abuse of a woman, physically and psychologically, is not considered a problem, whereas insulting or humiliating a man — or suggesting that men and women are equal — is considered offensively radical. Such ideas about the roles of women and men make measures like the "slapping law" possible. They are why victims of domestic violence have been forced to pay fines while feminist activists have gone to jail. To stop this cycle, an entire society will have to grapple with centuries of socially and politically condoned brutality toward women. And that will have to happen where the violence actually takes place: in the home. 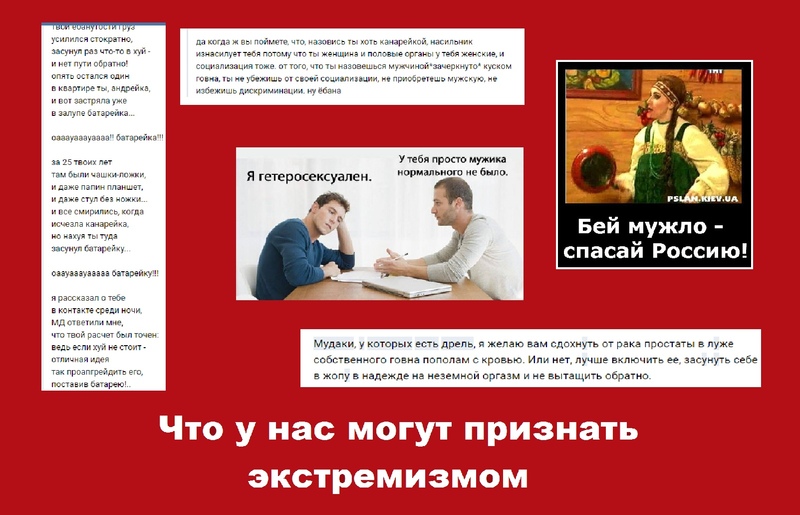 Indeed, whatever Batalina, Mizulina, Putin, and the church say, the slapping law does not protect the family. Rearing children, especially sons, who denounce violence does.